Deal is good for 4 hours of rafting and 2 hours of zip lining for 1 person. All equipment included and two instructors/guides. Please call 1.800.533.7767 to make a reservation. Explore the mighty Olympic Ocoee River with the #1 Ocoee River Rafting Company since 1977. Tennessee’s most experienced outfitter, Ocoee Outdoors will guide you through almost continuous class III, IV, and V whitewater excitement from beginning to end. 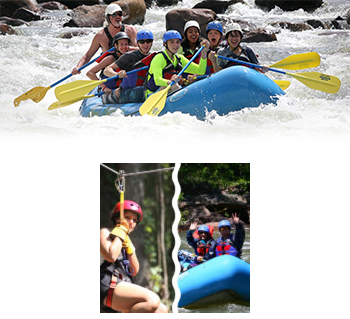 Experience the best of Tennessee when you book an Ocoee Outdoors Rafting trip and Ocoee Zipz tour! • Learn to zipline with family and friends! For rafting the age limit is 12 and the zip line is 6 years old and 60 lbs. Our rafting life vests are rated to 260 lbs. and the weight limit for the zip line is 250 lbs. This is for your protection and the protection of our guides. Reservations are required and please tell the reservation person you have a voucher. The price of the voucher does not include tax or gratuity.